SM West's Max Bullard corrals LHS' QB Brad Strauss. 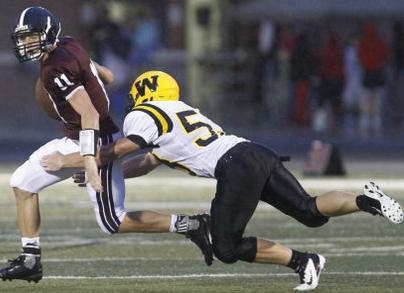 Photo courtesy the Lawrence Journal World. Instead of pouting about having to start at Lawrence in consecutive seasons the Vikings went out and got the job done. The fact that they won by six points despite virtually giving the game away twice in the final few minutes speaks to the team's character, and the potential strength of their defense. A quick history lesson: SM Northwest's best two teams of the past decade ('03 and '07) were both knocked out of the playoffs in the Sectional Round by none other than Olathe North. I'm sure this victory over Olathe North was a sweet one for the long-time SM Northwest faithful. New quarterback, no problem. Unlike most of the teams around the league who really struggled breaking in new quarterbacks (especially considering the weather), SM East's Jordan Darling picked up right where Dakota Collins left off. The Lancers new and improved defense could elevate them to another level this year. When I saw that sophomore phenom Venus Triplett had busted open the game with a 50-yard touchdown run I figured Olathe North was on the jetway to their first victory. Surprisingly, the Eagles really didn't get anything going after that point and suffered a disappointing opening game loss that nobody saw coming. That makes five straight losses for the program. Put it this way: the last time Olathe North won a football game was September 29, 2011--every other team in the league has won a game in that time frame except for the Eagles. Getting shutout at home is never the way you want to start a new season and things don't get any easier next week when they play at CBAC against Olathe East. If the Ravens don't develop some semblance of replacements for the talent they lost last season it could be a long year. The Raiders came out flat and had plenty of miscues in their week one loss to rival SM East. A touchdown or field goal would have made things better, but they didn't even manage to put a point on the board--meanwhile contributing two points to SM East's cause on an unforced safety. Jason Randall, Leavenworth: Randall had the benefit of playing on Thursday before the rain from Hurricane Isaac rolled into town and he took full advantage of it. He rushed for 198 yards and three touchdowns on just 10 carries. Brett Sterbach, SM West: The Vikings' senior running back carried the ball 27 times for 115 yards and three touchdowns to help his team to a week one upset win over LHS. 1. Olathe South (1-0): Olathe South threw zero passes, showed little on the offensive side of the football and played decent defense, but that's all they needed for their third straight victory over Olathe East. 2. Lawrence Free State (1-0): The combination of Kyle McFarland and Joe Dineen scored four touchdowns in week one and they pose one heck of a threat from here on out. 3. SM West (1-0): Running the ball effectively and playing great defense is something the Vikings did Friday that they haven't done well in recent years. If it continues, so will the wins over any team they play. 4. Lawrence (0-1): The Chesty Lion's week one hiccups made me think about just how big of an impact the loss of former offensive coordinator Mack Brown will have on LHS' offensive production this year. 5. 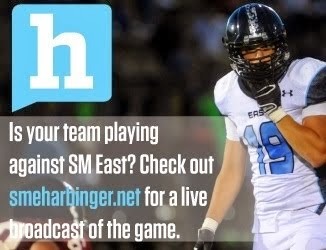 SM East (1-0): The most impressive thing about the Lancers in week one wasn't that their offense appeared like it could be lethal (in future, more dry weather) but rather how opportunistic their defense played all night. 6. Olathe East (0-1): For the most part the Hawks looked like their normal selves on Friday. They don't have a ton of playmakers but their whole is greater than the sum of its parts. They'll win more than they lose. 7. Leavenworth (1-0): Is SM North that bad or is Leavenworth decent this year? The evidence is pointing to the latter as the Pioneers will have a better chance to prove their worth against SM South this week. 8. SM Northwest (1-0): Literally nobody saw the Cougars beating Olathe North in week one, but it happened, and if they do it again this Friday at home against LHS watch out! 9. Olathe North (0-1): We'll find out real quick if the Eagle's week one loss to SM Northwest was fact or fluke when they face a very solid SM East team this Thursday. 10. SM South (0-1): There's no way around it--the Raiders played tentatively against SM East and paid for it with the final score. They have a chance to redeem themselves Friday at Leavenworth but it won't be easy. 11. Olathe Northwest (0-1): We didn't learn anything about the Ravens in week one besides the fact that they weren't very good in the home opener. With Olathe East this week we should see a more motivated unit. 12. SM North (0-1): The only thing that could be worse than getting thumped in week one by Leavenworth is having to travel to ODAC to play Olathe South in week two... oh, wait. Hey, vikingstudent, did Rice play at all at QB last week? It doesn't look like he did in the stat line. How is Coach Meyers week going so far??????? Did he say sorry yet?? I got to say, I've never seen Coach Myers coach a worse game. He kept running that pitch play which was a near disaster every time they ran it. Then not punting from his own 45 with ten minutes left??? I don't get it. They had successfully played the field position game, winning the punt exchanges regularly and got down to starting a drive at the South 32 before they threw the big INT. But they're back to their 45, you have plenty of time to exchange punts once, even twice more and pick up 10-15 yard on each exchange, you're in position to score again. After they missed that 4th down conversion the game was effectively over..you're just not going to drive 80 yards in that muck. I take back all the good things I said about him last week.